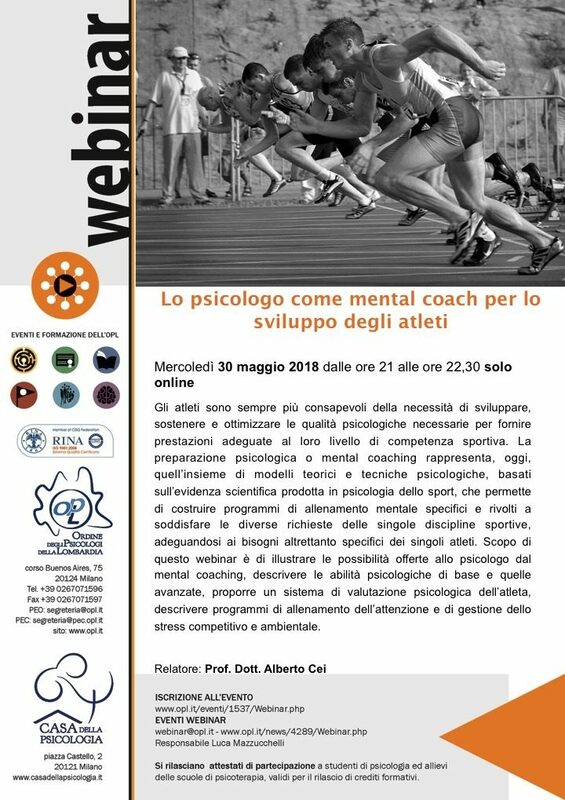 Published on February 11, 2019 in Allenatori, Calcio, Corsa, Generale, Giovani, Mental coaching, Stress, Tennis and Tiro a volo. 0 Comments Tags: blog, Lidia Pisano, psicologo. Open a blog, in sport psychology, is a great adventure, since challenge our ability to develop ideas that may be of interest to the world we call sports, which has inside many differences and a public much different motivated to the movement. For a psychologist the blog is a way to make themselves known and to verify his/her ability to understand the trends of our society and use them to propose ideas, comments, projects and anything else inspiring his/her daily life. Therefore, I am pleased that Lidia Pisano, a young psychologist, has taken this road, which is always a constructive and concrete way to test ourselves in disclosing the themes of athletes’ daily life and, in the same, of all are passionate of the movement writing about the contents of the Psychology. Published on May 21, 2018 in Allenatori, Calcio, Corsa, Generale, Giovani, Mental coaching, Olimpiadi, Stress, Tennis and Tiro a volo. 0 Comments Tags: ordine psicologi Lombardia, psicologo, webinar. Published on May 15, 2018 in Generale and Mental coaching. 0 Comments Tags: best practice, movimento, psicologo. The profession of sport psychologist in Italy is not as widespread as one would expect for many reasons linked to our cultural backwardness both in sport than in the academic world. Among these reasons, there is one that concerns the lack of knowledge by managers and coaches of where and to whom to direct their offers of counseling psychology of sport for their clubs. Often the choice of the sport psychologist occurs through the direct or indirect personal knowledge. Everyone knows doctors, but no one would think to go to an orthopedic surgeon when needed instead of a cardiologist or viceversa. In many people’s minds is dominant the idea that to work in sports is enough to be psychologists and not sport psychologists. The reaction of the psychologist who are offered this opportunity is immediately positive but shortly after he began the frantic search for a colleague who is sport psychologist to talk to and ask for advice on what to do. Result: the psychologist will present to the club a program that includes the implementation of skills that she does not have and will bring discredit on the sport psychologist profession. This approach would allow the sports psychologists to gain greater credibility with regard to the professional sports world, it would be a stimulus to research how to support their interventions and to share on a wider audience their activity. We need to get out from logic “believe in me” and become carriers of a culture of data-driven work. With this aim the Italian journal of sport psychology, Movimento has planned to publish a special issue devoted to best practices in sport psychology open also to the contributes coming from other countries. Those interested can send an abstract to this email address by June 30. I am at your disposal for any further clarification. Mental coach or sport psychologist? Published on January 31, 2018 in Allenatori, Calcio, Corsa, Generale, Giovani, Mental coaching, Olimpiadi, Stress, Tennis and Tiro a volo. 0 Comments Tags: Gazzetta dello sport, mental coach, psicologo, SportWeek. Have you the skills to work with top teams? Published on February 27, 2017 in Mental coaching, Olimpiadi and Stress. 0 Comments Tags: competenze, psicologo, sport, squadra, team, Vela. The following are the main tasks and goals that sport psychologist working with the GB sailing is asked to do. Every young sport psychologist can assess if his/her professional competences match these requests. Published on May 10, 2016 in Allenatori, Calcio, Generale, Giovani and Young and Football. 0 Comments Tags: consulenza, psicologo, Scuola, sport, squadra. Enclosed you find the consultation proposal that Cei Consulting proposes to soccer school in our Country. Are you looking for the sport psychologist for the next season in your football school? Have you never had this kind of collaboration and want to know more? CEI Consulting offers you a chance to have a custom design for your football school with a qualified sport psychologist. A team of sport psychologists coordinated and supervised by Dr. Daniela Sepio, Sport Psychologist, expert in youth football, will study a plan tailored to your football school. These are just some of the interventions, but the better interaction comes from the knowledge 0f the specific needs of the soccer school. For this reason you can contact us to learn more and get an idea of ​​what can be a customized proposal for your football school. Published on March 25, 2016 in Allenatori, Corsa, Generale, Mental coaching, Olimpiadi, Stress, Tennis and Tiro a volo. 0 Comments Tags: psicologo, ruolo. Just a few months at the beginning of the Olympic Games in Rio 2016. Following the guidelines of the sport psychologist who is part of the Olympic team. Published on September 24, 2015 in Allenatori, Calcio, Generale, Giovani and Young and Football. 0 Comments Tags: elite, FIGC, psicologo, scuole. For a long time, 15 years, the Italian Football Schools to get the highest level of qualification by Football Federation had an obligation to work with the sports psychologist. This year the situation has changed, obviously for the worse. At this data it must be added that the Youth Scholastic Sector of FIGC no longer has a psychologist on committees, much less a psychologist among its consultants. While the sports world, and also soccer at abroad, including for youth activities the sport psychologist, because it recognizes the usefulness in training young people, in collaboration with the coaches and the management of relations with parents, the Italian managers take opposing choices dictated by the only criterion not to change anything to keep our soccer in a state of immobility.